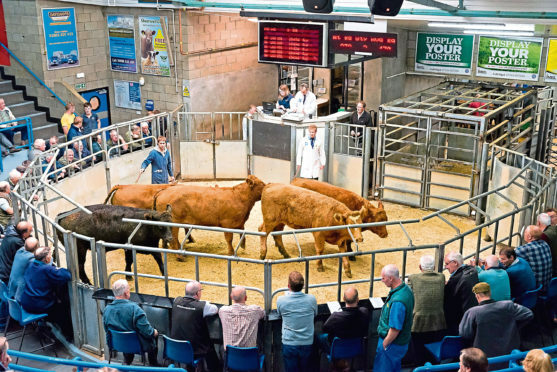 Aberdeen and Northern Marts (ANM) deputy head of livestock, John Angus, selling cattle at Thainstone. Store cattle are likely to hit the market earlier this spring due to winter feed supplies being exhausted, claims Aberdeen and Northern Marts (ANM). The company’s head of livestock, John Angus, said finishing cattle had done well over the winter as they were generally housed earlier and more barley was fed to compensate for scarce silage. He said cattle courts were emptying and finishers were in the market for heavier store cattle to finish inside or lighter cattle to go on to grass. “It’s a Catch 22 situation. Margins on finishing cattle are tight because of high feed costs, which is understandably making buyers more cautious but breeders need the money to cover their costs,” said Mr Angus in ANM’s latest market report. He said he expected yearling stores to start coming to the market, to go on to grass, from the middle of February onwards and he is confident they will be wanted. ANM said silage and hay were still commanding premium prices, with good quality hay making more than £40 per bale to the horse market, and there had been no easing yet in the price of straw at the company’s weekly fodder sale at the Thainstone Centre, Inverurie, on a Friday. Despite this, Mr Angus said there was still confidence in the market and a good offering of heifers met a strong trade earlier this month. In-calf heifers, due in February and March, averaged £1,700, while heifers with calves at foot sold for more than £2,000. Mr Angus said: “It is encouraging to see breeders replacing their breeding stock. Meanwhile, ANM prime and cull cattle manager Tim McDonald said trade for cull cows was improving with prices up about 14p per kg in recent weeks. The market for prime cattle is also tighter, according to ANM, and abattoirs moving cattle quickly could be an indication of scarcity, which should help prices firm.